Use Microsoft Dynamics 365 Layout to create and design space plans on HoloLens or on a Windows Mixed Reality immersive headset. 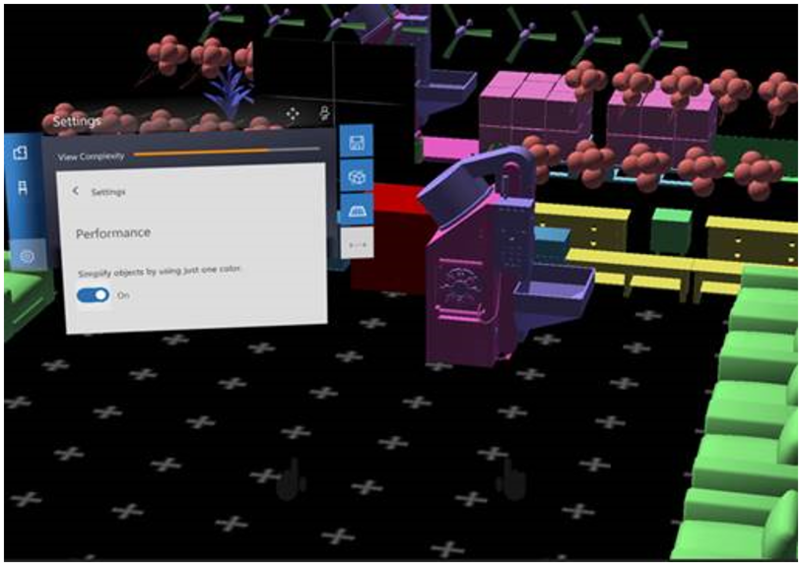 Import 3D models and design, edit, and collaborate virtually, on a real-world scale. Need more help? Check out the Layout FAQ for answers to common questions. Watch how-to videos about Layout. A subscription to Layout. The Layout subscription also includes the Microsoft Dynamics 365 Import Tool (Preview) for PC. You can try Dynamics 365 Layout for free for up to 90 days. Learn more about the free 90-day Dynamics 365 Layout trial. A HoloLens running the Windows 10 April 2018 Update and/or a Windows Mixed Reality immersive headset. A Windows Mixed Reality-ready PC running the Windows 10 April 2018 Update. How you install Layout and the Import Tool depends on how your administrator chooses to distribute the apps. Your admin may have you install the app from the Microsoft Store for Consumers, from your organization’s private store, through an email link, or another method. The following table describes the app/tool, and how to install them from the public store. On your HoloLens, go to Start > Microsoft Store , search for “Dynamics 365 Layout," and then install the app. 1. On your PC go to Start > Microsoft Store , search for “Dynamics 365 Layout," and then install the app. 2. Connect your mixed reality headset to the PC and find the app on the mixed reality Start menu. On your PC go to Start > Microsoft Store , search for “Dynamics 365 Import Tool (Preview)," and then install the app. To use Layout, you create space layouts on your HoloLens or PC, and then use a HoloLens or Windows Mixed Reality immersive headset to place 3D models in the layouts. The Layout app comes with a set of preinstalled models, and you can also add your own. Use Microsoft Visio to design a floor plan, and then export it to HoloLens or Windows Mixed Reality. Use Layout on your HoloLens to scan a space. Select About, and then select the 32-bit or the 64-bit download (choose the one that matches your version of Visio). 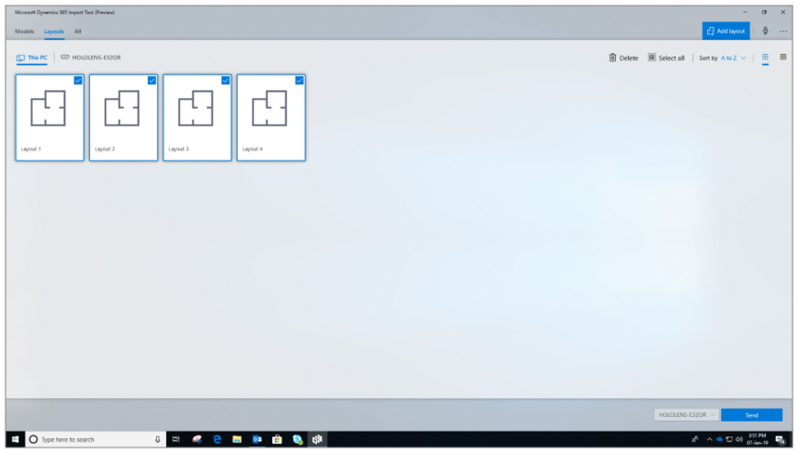 Open Visio, and then select File > Options > Add-ins. Next to Manage, select COM Add-ins, and then select Go. 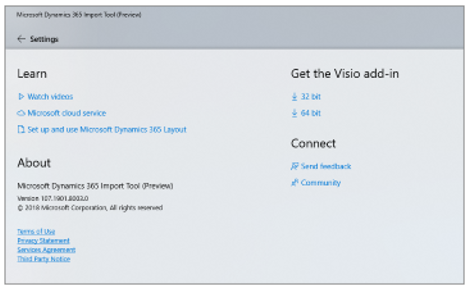 Select Visio Add-in for Dynamics 365 Layout, and then select Add. When the floor plan is ready, select the Layout tab, select Export, and then save your floor plan. In the Import Tool, select This PC > Add layout, and then navigate to the floor plan. Select the floor plan, and then select Open. The floor plan will show up automatically in Layout on a mixed reality immersive headset connected to the same PC. Connect your HoloLens to your PC using the USB cable. Open the Import Tool on the PC, and then select This PC > Layouts. Select the check box on the layouts you want to copy, and then select Send. On HoloLens, open the Layout app. You’ll find your layout on the Layouts tab. 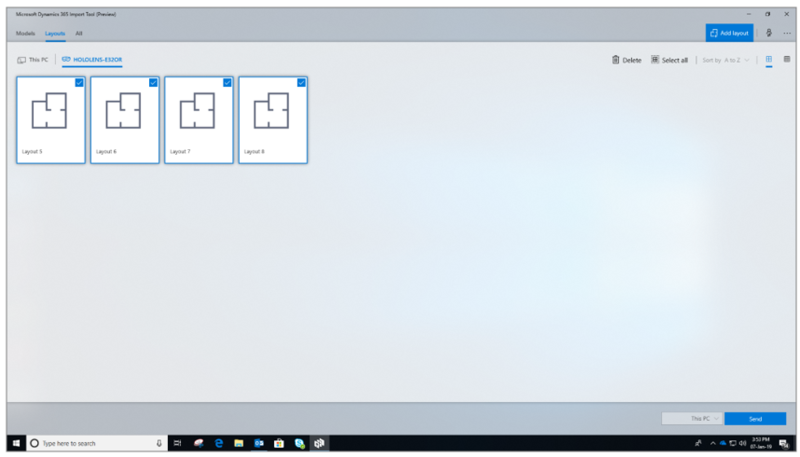 On your HoloLens, open the Layout app. Select New layout, and then follow the instructions for scanning your space and creating a layout. Connect the HoloLens to the PC using the USB cable. Open the Import Tool, and then select the HoloLens name. Select the check box on the layout you want to send to your PC, and then select Send. On HoloLens and in Windows Mixed Reality, you can place, move, copy, resize, and rotate 3D models. Place Select Models, and then gaze and air tap to select the model you want to place. Use gaze to move the model, and then air tap again to place it. Move Gaze at a model, and then tap and hold it. Move your hand to reposition the model, then release. Copy Gaze and air tap to select the model, and then select Copy. Move the model where you want it, and then air tap to place it. Select Done. Resize Gaze and air tap to select a model, and then select Resize. Tap and hold any edge of the model, and then move your hand in or out. Rotate Gaze and air tap to select the model. Select one of the rotation arrows to rotate 90 degrees. For more precise rotation, tap and hold the round rotation control, and then move your hand to rotate. Multi-select Gaze at an empty spot. Tap and hold, and then move your hand diagonally to form a rectangle around all the models you want to select. Gaze at any of the models you’ve selected to see what you can do with all of them. Place Select Models on the app menu. Point your controller at the model you want, and then pull and hold the trigger to pick it up. Point to where you want to place the model, and then let go of the trigger. Move Point at the model and pull and hold the trigger. Move your controller, and then let go of the trigger to place it. Copy Select the model, and then select Copy. Point your controller to where you want to place the copy, and then pull the trigger again to place it. To place multiple copies, just point and select again—no need to go back to the original. Select Done on the last copy. Resize Select the model, and then select Resize. Point at one edge of the object, and then pull and hold the trigger. Drag the edge, and then release the trigger. Rotate Point and pull the trigger to select the model. Then point at one of the rotation arrows and pull the trigger to rotate the model 90 degrees. For more precise rotation, use the round rotation control: point, pull, and hold the trigger, and then move your controller to rotate. Multi-select Point your controller at an empty spot. Pull and hold the trigger and drag to form a rectangle around the models you want to select. Point at any of the models you’ve selected to see what you can do with all of them. In certain scenarios, textures or multiple colors might not be important for visualizing 3D models. In these cases, to improve performance, you might want to turn off textures and use a single color. You can do this by using the Performance setting. Select Settings, select Performance, and then select the Simplify objects by using just one color option.